The iPhone 6 with its 4.7-inch screen and the iPhone 6 Plus with its 5.5-inch screen offer improved GPS features to users. 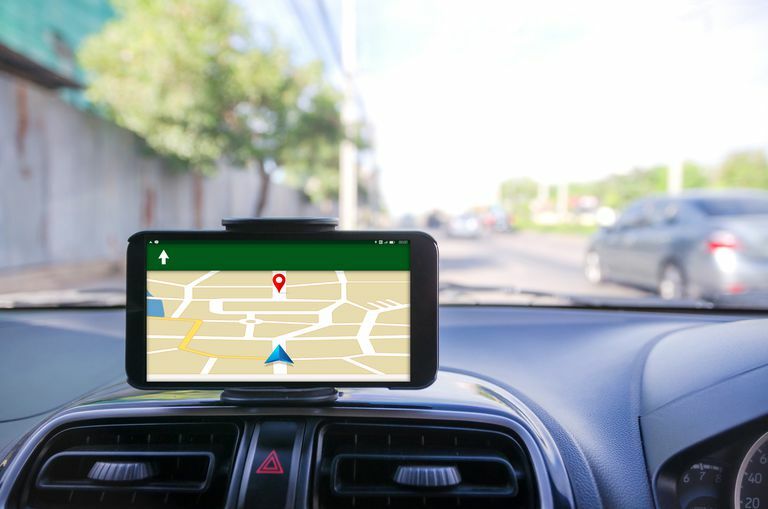 The large screen size is a significant plus for iPhone GPS navigation apps because using maps and following turn-by-turn directions can be squint-inducing on smaller screens. The iPhone 6 uses a fast and efficient A8 chip, which benefits GPS apps in several ways. GPS apps are notorious for depleting phone batteries, so energy savings anywhere in the system help the iPhone go the distance with GPS activated. The iPhone 6 has a built-in GPS chip like its predecessors. You don't need to set up the GPS chip on your phone, but you can turn it on or off. It uses the GPS chip in conjunction with Wi-Fi networks and nearby cellphone towers to calculate the phone's location. This process of using several technologies to establish location is called assisted GPS. The Global Positioning System (GPS), which consists of 31 operational satellites in orbit, is maintained by the U.S. Department of Defense. The GPS chip uses a process called trilateration, in which it locates at least three of the possible satellite signals to establish a location. Although other countries are working on satellites of their own, only Russia has a comparable system, called GLONASS. The iPhone GPS chip can access GLONASS satellites when needed. The iPhone can't always receive a GPS signal. If the phone is in a location that prevents clear access to signals from at least three satellites—such as when it is in a building, heavily wooded area, or canyon or among skyscrapers—it relies on nearby cell towers and Wi-Fi signals to establish location. This is where assisted GPS gives the user an advantage over stand-alone GPS devices. GPS on the iPhone can be turned on and off in the Settings app. Tap Settings > Privacy > Location Services. Turn off all Location Services at the top of the screen or turn Location Services on or off for each app listed at the bottom of the screen. Note that Location Services includes the use of GPS, Bluetooth, Wi-Fi hotspots and cell towers to pinpoint your location. Many apps want to use your location to pinpoint where you are, but no app can use your data if you haven't given it your permission in the Privacy settings. If you allow websites or third-party apps to use your location, read their privacy policies, terms, and practices to understand how they plan to use your location. The Apple Maps app on the iPhone 6 relies heavily on GPS to function accurately. Each iOS generation provides further improvements in Apple's map environment, following the well-publicized shortcomings of the company's first Maps effort. Apple has continued its acquisition of map and map-related companies to provide better service.